My last two exchanges for the year were sent out this month. The first one for the HoE floss tag exchange is still traveling, I guess - or it is MIA. I'm hoping it's just taking the scenic route to its new home and will eventually get there. The other one made much better time - just a couple of days to find its way to Vonna (for the same small exchange that I received the gorgeous pinkeep from Becky!) 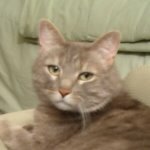 I've been busy with the Tiny Treasures Exchange setup so I've neglected this blog for far too long, so I will start on the road to recovery by posting the pictures of the exchange for Vonna. I originally planned to stitch another Prairie Schooler chart very similar to the one I did for Cathy B for the HoE Prairie Schooler Exchange. I had the fabric, all the flosses and the chart ready to go, and then.....I changed my mind, just minutes before I was to begin stitching. 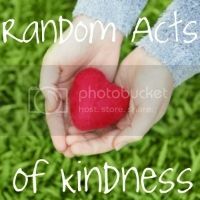 I had planned to get it all done and on its way early for a change but I received a note from the Brooke’s Books Interactive Group that a new chart had been posted so, of course, I had to check it out. I just loved it and decided to stitch it instead (because Cathy B was in this same exchange I thought it would be nice to stitch something different, anyway.) Of course that meant a bit of a delay getting started since I needed all new colors of floss, some new embellishments..... You get the picture! Needless to say, I just barely made the mailing deadline but it was a really fun design to stitch and it turned out well. Vonna seemed very pleased with it, too, so I'm glad I made the switch. 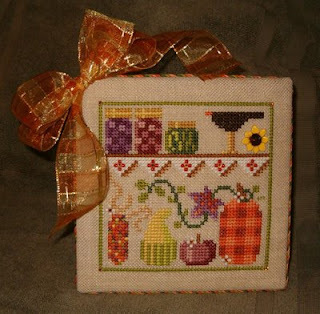 Autumn Pantry Challenge Chart by Brooke Nolan (Brooke's Books) Stitched on Wichelt/Permin Lambswool 18 count Linen over 2 using DMC floss, Swarovski Crystal topaz montees, Mill Hill Sunflower Button, and red and white size 8 seed beads. I used the same backing fabric (this was the perfect fall fabric - it went wonderfully with everything!) as I did for Cathy B's flatfold but I forgot to take pictures of the back this time. 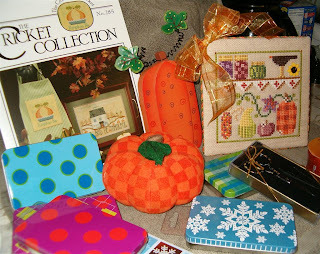 And here is the whole exchange : a Cricket Collection chart and Cheetah scissors from Vonna's wishlist, six tins (because she loves tins), some ribbon for finishing and a couple of pumpkins just for fun. Vonna has much better pictures on her blog (here). She seemed to be quite pleased with the exchange - always a relief to know the recipient likes what you chose! That was an amazing exchange piece that you stitched for Vonna! This is absolutely beautiful!!! What a great package you put together! !